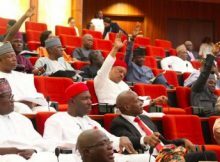 The Senate has passed the Whistle-Blowers Protection Bill, which recommends a five-year jail term or 10 million naira fine against persons who raise false alarm on hidden loot. The upper chamber of the National Assembly also approved that five per cent of loot recovered as a result of information from a whistle-blower be given to the informant, as currently being practiced by the Federal Government. The passage of the bill, which was sponsored by the Deputy Minority Whip, Abiodun Olujimi, followed the consideration and adoption of the report by the Senate Committee on Judiciary, Human Rights and Legal Matters. The panel said the bill was to build a legal framework for whistle-blowing as part of the anti-corruption campaigns of the current administration.